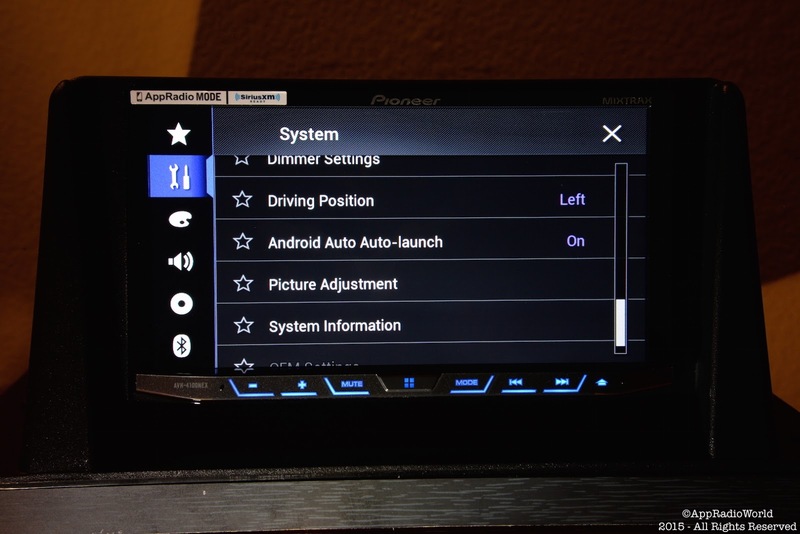 Pioneer Electronics announced its second generation NEX head units at CES 2015 earlier this year. The biggest addition to the products was Android Auto compatibility. But Pioneer's latest and greatest head units offer more than just that. Whether you are an Android or iOS user, Pioneer's second generation NEX devices has you covered. 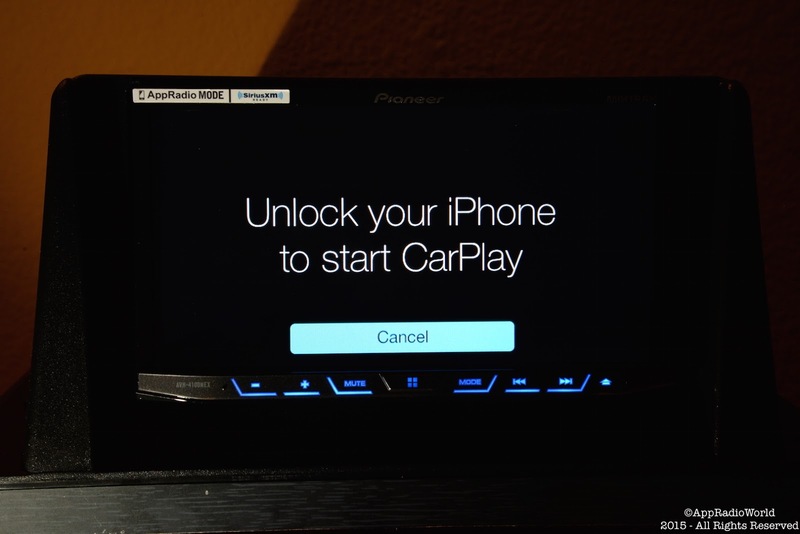 Want Apple CarPlay? You got it! 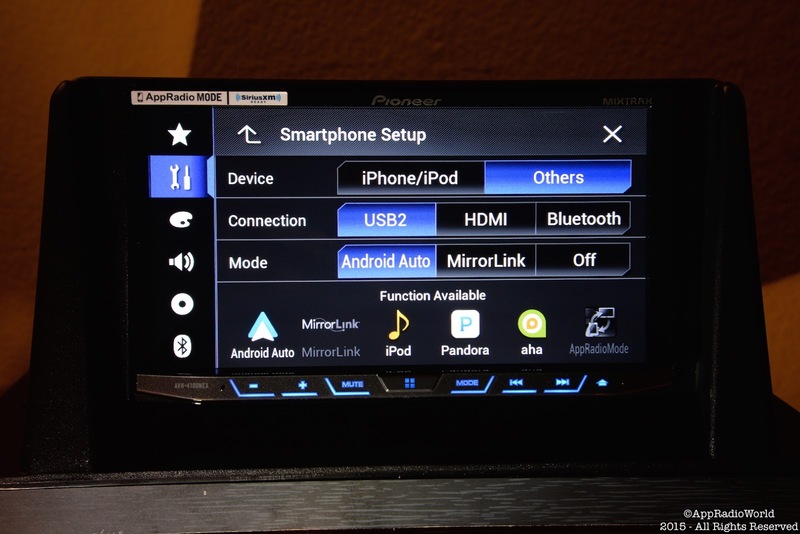 Want Android Auto? You got it! Three of the five NEX head units announced at CES 2015 offer both technologies. The AVIC-8100NEX is Pioneer's flagship head unit. The AVIC-8100NEX, along with the AVIC-7100NEX offers standalone GPS systems that do not require smartphone connectivity to work. But this also means these devices are significantly higher priced. If you're on a budget but still want to have the latest in-car technology in your vehicle, the AVH-4100NEX maybe your best bet. Pioneer sent out a review unit to me a few weeks back and I have been testing it out since. Let me tell you why you and your car deserve to have the best double-DIN head unit without breaking the bank. This is my full review of the device. Note: When you purchase anything on Amazon or eBay using the links above or any of the other links on this site, you help support this site. It doesn't cost you anything extra but kicks back a few bucks our way. Thanks for all the support. In-car infotainment system technology has undergone a rapid transformation even since Apple announced CarPlay. Since then, Google has introduced Android Auto and together, the two tech giants play fierce competitors for your car dashboard landscape. Hence, a device that offers both softwares is an instant winner. 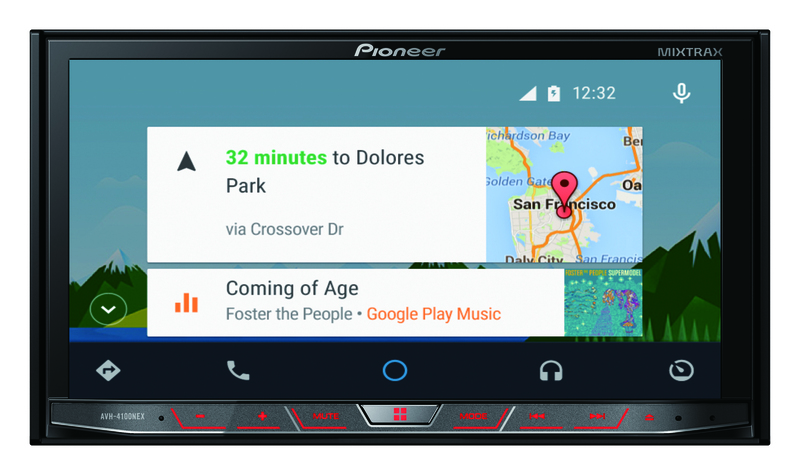 Pioneer became the first aftermarket manufacturer to offer both CarPlay and Android Auto in the same device. 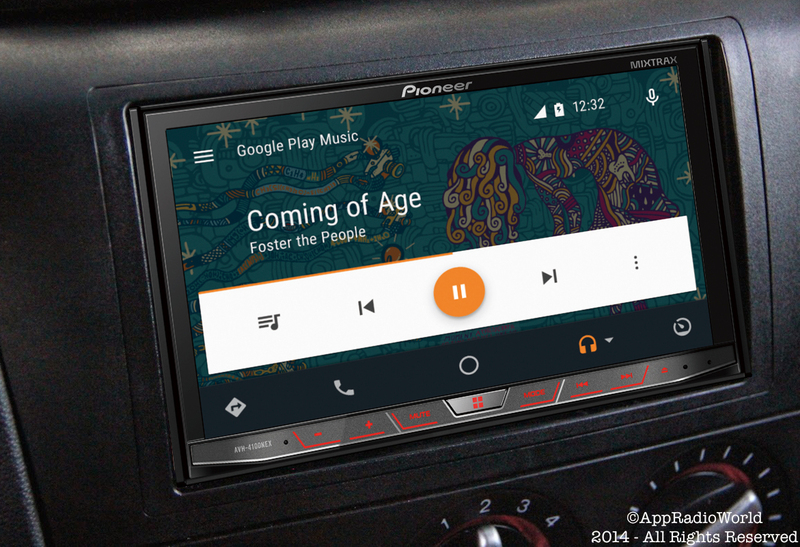 In fact, when those second generation NEX head units were announced, I was curious to know how Pioneer would improve on an already robust line of first generation NEX head units, apart from adding Android Auto. But Pioneer has delivered! The NEX software is the best thing to happen to Pioneer in a long time, in my opinion. And with the second generation head units, Pioneer has made subtle yet significant improvements to the software. 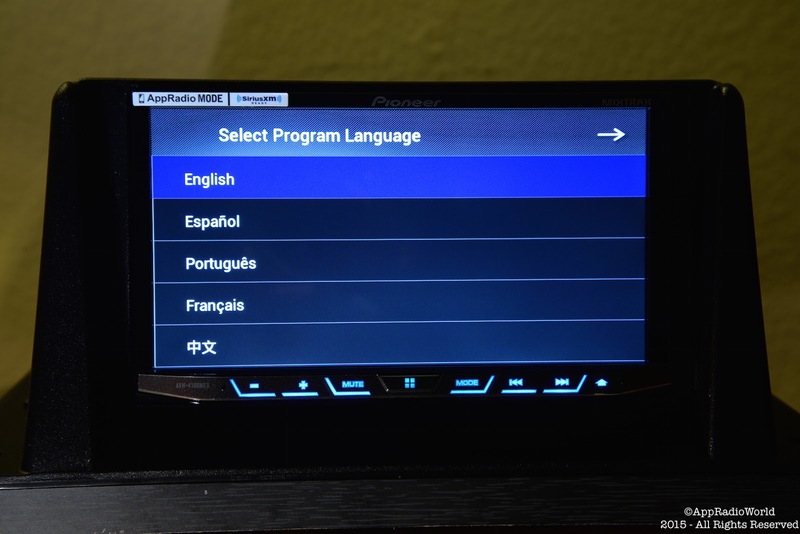 To explain, let me dive into more detail on the AVH-4100NEX. When you first turn on the AVH-4100NEX, what will catch your eye is the large, 7-inch display. The device features a resistive touchscreen, unlike the AVIC-8100NEX which has a capacitive touchscreen. But don't be fooled by that. The word 'resistive' is bound to bring back bad memories of clunky old GPS devices that were difficult to operate. But the technology has come a long way since. The resistive touchscreen in the AVH-4100NEX is brilliant! In fact, it almost looks and behaves like a capacitive touchscreen. The display is very responsive with no noticeable lag at all when navigating through the menus. It does not feel like a resistive touchscreen at all. The next feature is the protruding button bar at the bottom of the screen. I actually like the button bar. 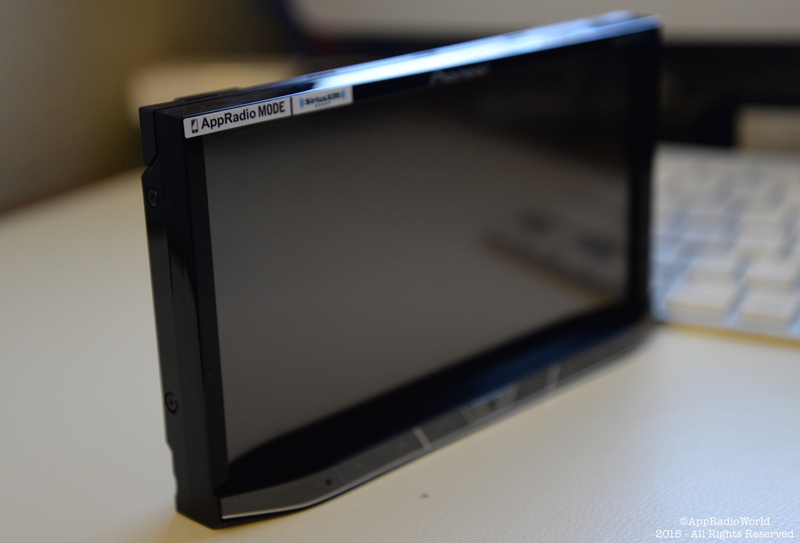 Don't get me wrong, I love the sleek and flat look of the Pioneer AppRadio 4 (SPH-DA120) but the button bar allows you to rest your fingers on it while using the touchscreen. This makes things a lot easier while driving. The button bar has buttons for volume control, home button, Mode, tracking and eject. All the buttons sit flat on the button bar with the exception of the home button which is raised a little. But all buttons click when pressed, unlike the capacitive buttons on the AppRadio 4 which respond to touch. A hard reset button is located on the right corner of the button bar. 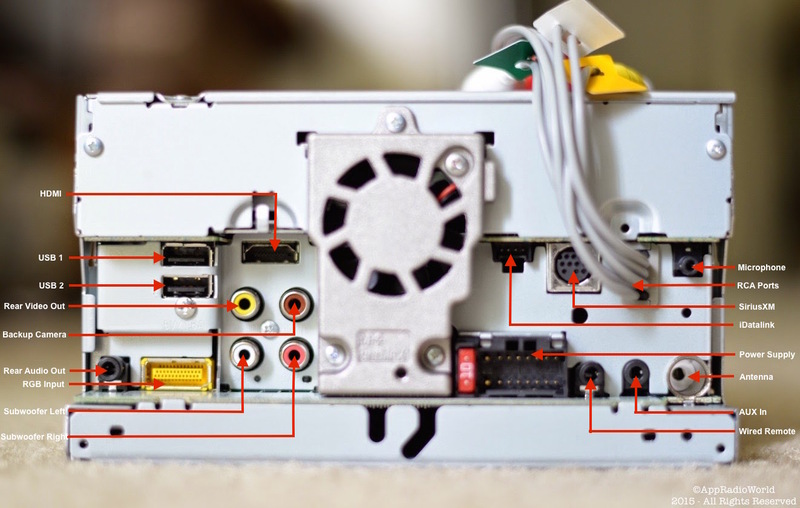 Hiding behind the faceplate (or front panel, as Pioneer calls it in the user manual) is the CD/DVD drive slot, SD Card slot and the Auto EQ Mic input. These can be accessed by clicking on the eject button on the button bar. The faceplate is completely detachable as a security feature. More details later. The AVH-4100NEX also includes a remote control (battery included). The remote control can be used to control most playback functions. HDMI, two USB ports, three RCA preamp outputs, backup camera, microphone, terrestrial radio antenna, wired remote, and AUX in. Additionally, a SiriusXM Connect Vehicle Tuner port and iDatalink Maestro port are also included. There is no connection for a GPS antenna as seen on a AppRadio 4. A couple of quick notes about installation. To install a double-DIN head unit in your vehicle make sure you have the necessary dash kit and harness. Upgrading from an OEM in-car infotainment system to an aftermarket system will require extra research as to what you exactly need. If your vehicle already has an aftermarket double-DIN head unit, your job will be a lot easier. I always recommend getting the device installed by a professional technician. If you choose to do it yourself, proceed at your own risk. 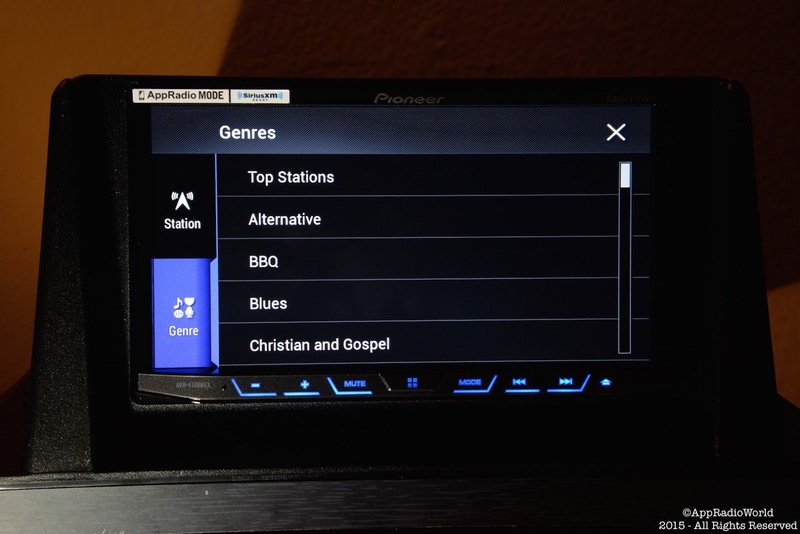 In my case, I already had a Pioneer AppRadio 4 (SPH-DA120) installed in my car. So upgrading to the AVH-4100NEX was a breeze. I just unplugged the AppRadio 4 and plugged in the AVH-4100NEX. I left the GPS antenna disconnected as this is not required. When you first boot up the AVH-4100NEX you will be greeted with a Pioneer splash screen. You will then be asked to choose the language of your choice. After making the language selection, you are brought to the smartphone setup menu. Here you will select whether you want to use Apple CarPlay or Android Auto. For CarPlay, use USB 1 to connect your iPhone. In case of Android Auto, you'll have to use USB 2 for connection. Pioneer AppRadio Mode users on iOS will have to select iPhone/iPod and then Digital AV Adapter. Yes, you still need an HDMI cable and Apple Digital AV Adapter to use AppRadio Mode on the AVH-4100NEX. Android users will have to select Others and then the corresponding connection to use AppRadio Mode. Compatible Android connection kit or cables will be required. After you pick your smartphone setup settings, you will be shown the usual warning message. Clicking OK confirms you have read the necessary precautions and warnings. From here you are taken to the NEX homescreen. I suggest clicking on Settings and going to Bluetooth settings under System to setup your smartphone. This will be useful when making a call over Bluetooth or Bluetooth Streaming. Pioneer's NEX software deserves all the praise it gets from reviews across the board. And Pioneer has improved NEX in its second generation devices significantly. The interface is noticeably quicker. Navigating through menus is a breeze. If you've used a first-generation NEX head unit, you will notice the difference. If you're new to NEX, you will find getting used to the menus to be very easy to pick up. Additionally, the second generation NEX software includes menu options for Android Auto which were not present in the previous version. My favorite NEX feature is the Favorites list. You can tap on the star symbol on any menu item to add it to Favorites. I currently have the Smartphone Setup menu added there along with a couple of others. That list will grow as I go along and find menu items I use more often. To use Apple CarPlay, you will need an iPhone 5 or later running iOS 7.1 or later. Apple CarPlay works just as advertised. If you aren't familiar with the technology, CarPlay is Apple's foray into the car infotainment field. It puts commonly used iOS features in your car's dashboard along with select third-party applications. The CarPlay interface is easy to use and navigate through. The first thing I noticed is the two arrows at the bottom of the display which can be used to scroll through homescreen pages. I'm not sure if this has just been added or whether it was always present for 7-inch devices. You can also scroll by swiping left or right though. The larger screen of the AVH-4100NEX compared to the 6.2-inch AppRadio 4 is a welcome upgrade. The extra real estate means the app icons appear larger and more spaced out. CarPlay is an iOS feature and all improvements are provided by Apple themselves. Pioneer has no control over its features or issues. The software has evolved slowly but surely over the last few months with some nice features being added. For example, you can now enjoy CarPlay without having to unlock your iPhone. I tested out CarPlay on the AVH-4100NEX with two different iPhones. One was an iPhone 6 running a jailbroken version of iOS 8.1.2, while the other iPhone 6 I tested was running the latest iOS 8.3. Both worked without any issues. To use Android Auto, you will need a compatible Android smartphone running Android 5.0 Lollipop or later. You will also need the Android Auto app from Google Play for your particular smartphone. Android Auto is Google's answer to Apple CarPlay and puts a few native Android apps along with select third-party applications together in one easy-to-use interface. Like CarPlay, the Android Auto interface is locked to a specific layout. The interface is not very customizable. I tested Android Auto using a Galaxy Nexus 6 running Android 5.1 Lollipop. It worked very well. Android Auto currently holds the advantage over Apple CarPlay, in my opinion, simply because it offers way more third-party apps. Also, I found Google's voice assistant to be more intuitive compared to Siri when asked for certain information. Things could change in the future though. Android Auto and CarPlay can easily thrive separately. This is because iOS and Android users are almost mutually exclusive. Very seldom will you find someone using both platforms. Families that have both types of users will benefit immensely from a device like the AVH-4100NEX since it offers connectivity options for both. The downside to Android Auto is that not all Android smartphones are capable of Android Auto. Even if you have Android 5.0 Lollipop installed, it doesn't mean you'll be able to use Android Auto. The fragmented nature of the operating system has therefore led to delays in adoption of the technology. 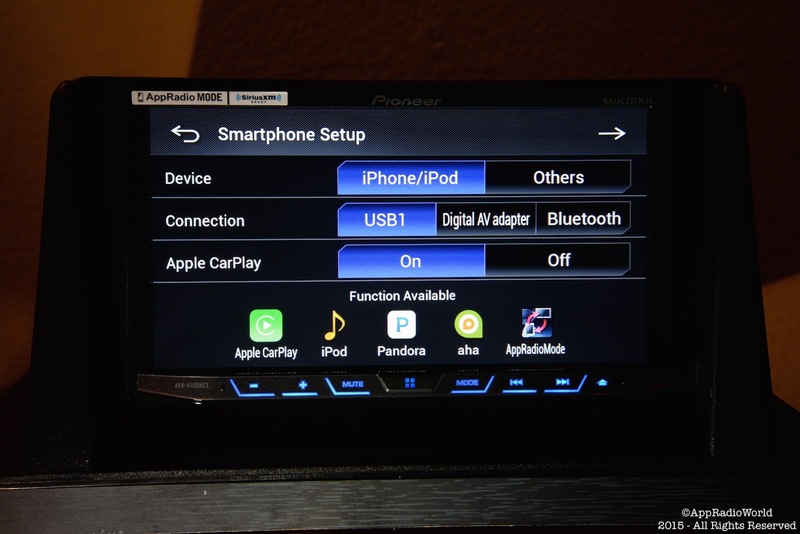 Pioneer had AppRadio Mode way before Apple even conceived CarPlay. AppRadio Mode allows users to run third-party applications on the head unit. AppRadio Mode has been in existence since 2011 and has gone very gradual changes. There are still a lot of challenges and issues the technology faces but the feature is still in existence and is used by many people. I tested out AppRadio Mode with my iPhone 6 running iOS 8.3 and it worked quite well. The larger 7-inch touchscreen compared to the AppRadio 4 is also useful here. One of the latest improvements to AppRadio Mode was Launch Through, where users could select a specific third-party app to launch when starting AppRadio Mode. This feature was added a few weeks ago. Most of the issues that existed when iOS 8 came out have been ironed out in iOS 8.3. Screen resizing has been fixed for the most part and the app crashing issue due to the iOS 8 keyboard has also almost disappeared. With CarPlay and Android Auto coming to the forefront, however, the innovation and improvement of AppRadio Mode will be a challenge for Pioneer. 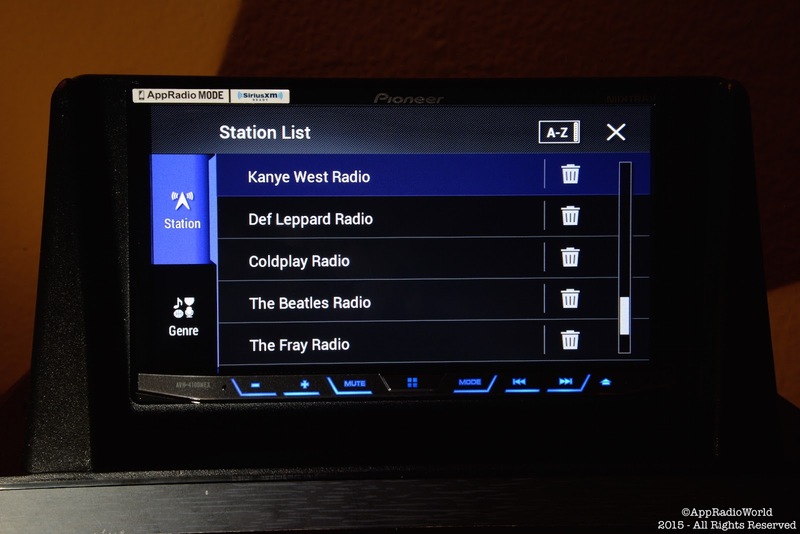 Pandora has been added as an independent AV source on the second generation NEX head units. And, the service has seen marked enhancements in recent times on NEX. The biggest of them all is station creation. 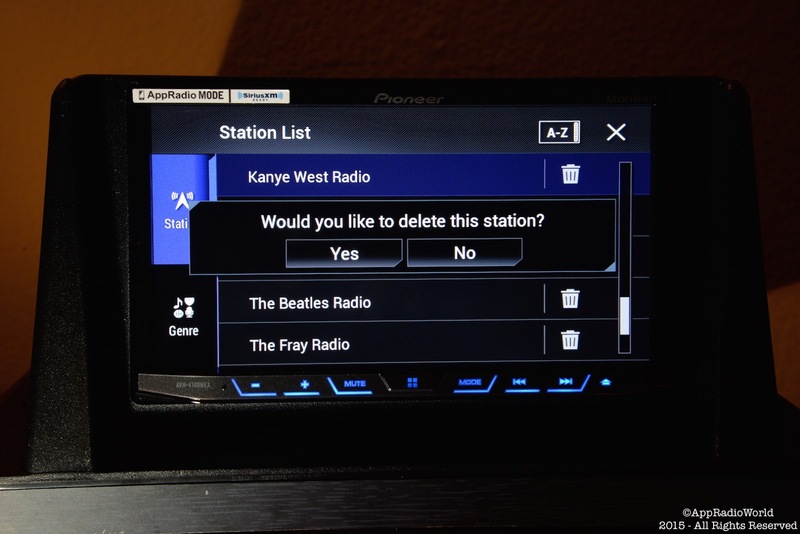 You can now create new stations directly on your head unit, instead of having to do it on your smartphone. You can also delete stations and stream music based on genre. Pandora has advertisements unless you are subscribed to Pandora One. Worked great on both iOS and Android. As I mentioned earlier, you will need to setup and pair your smartphone and the AVH-4100NEX via Bluetooth before you can stream audio content. Pioneer added the ability to browse your library over Bluetooth a few months ago. This was a great addition to the feature set. You can now navigate through your library on the head unit itself, as if you were doing it on the smartphone. One thing to keep in mind is that Bluetooth Streaming works only when the smartphone is not wired to the head unit. If you are streaming music over Bluetooth and happen to plug in your phone, the music cuts out. The head unit instructs you to disconnect your smartphone to continue streaming. This is important because you won't be able to charge your phone when streaming. Unless, of course, if you have it plugged in to a 12V power source and not the head unit. The AVH-4100NEX offers SiriusXM Connect Vehicle Tuner connectivity. When connected, the SiriusXM icon under the 'AV' menu in NEX lights up. You can then click the icon to complete the setup of your device. You have to be subscribed to SiriusXM to use the service. To setup after subscribing, click on SiriusXM in the 'AV' source menu and tune to Channel 1. Switch to Channel 0 and note down your Radio ID. The Radio ID can also be found at the bottom of the SiriusXM Connect Vehicle Tuner screen. You will need this ID number to activate your subscription. I did not test out the SiriusXM functions. With iDataLink Maestro, users can retain and control many of the OEM dashboard functions right from your AVH-4100NEX. You will need to purchase an iDataLink Maestro module and connect it to the back of the head unit. The module has to be flashed with the appropriate vehicle and head unit firmware before use. Refer to the user manual for more details. 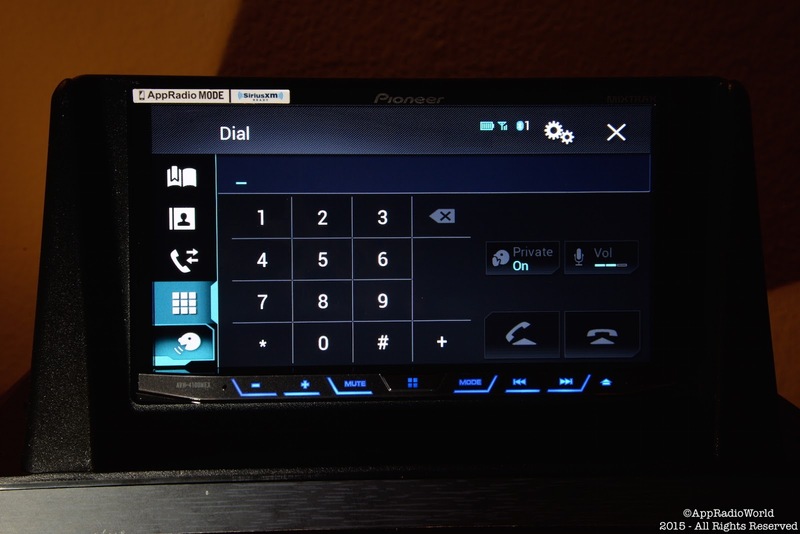 There are several ways you can use your AVH-4100NEX to make and receive calls. The two common ways are through Apple CarPlay or Android Auto which both require your smartphone to be hardwired to the head unit. But there is another way and it is via Bluetooth. After you pair your smartphone to the head unit, you will be able to use the phone function. Here you can view your entire phonebook and call lists. You can dial numbers using the dial pad. Additionally, you can also make calls using the voice assistant. MIXTRAX is Pioneer's own virtual DJ that mixes your music library on the fly. MIXTRAX is available only for music present on a USB drive or SD Card. You cannot use the music library on your smartphone. The virtual DJ analyzes the music on your drive and plays it based on the beat or mix you choose. It seems to work quite well for the most part but has its moments sometimes. The AVH-4100NEX offers multiple Audio features starting with the unique 13-band Equalizer. There are also advanced features like Time Alignment, Listening Position and Crossover Functions. But you don't necessarily have to be an advanced user to figure out what settings work best for you. There are a variety of preset options to choose from. Don't be afraid to toggle sound settings in an attempt to find the perfect sounding option. You can always reset your sound settings to factory defaults in the Settings Menu and start over. Audiophiles will love the AVH-4100NEX for its ability to play FLAC audio. Lossless audio compression is one of the newer technologies available. 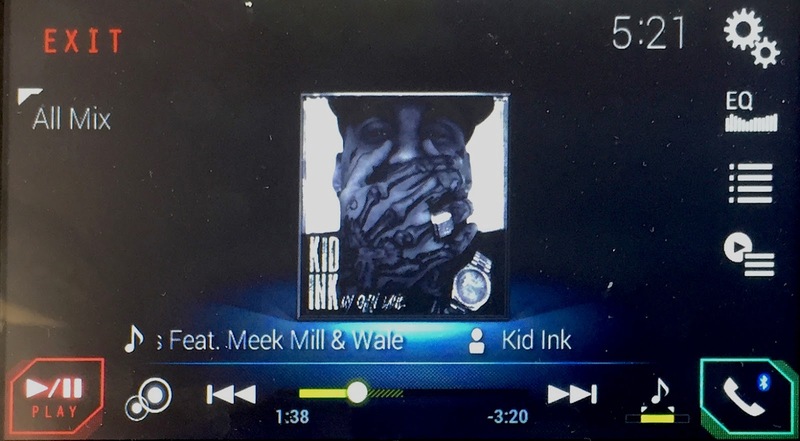 FLAC audio files can be loaded onto a USB drive or SD Card and played on this head unit. Sound quality is excellent on the AVH-4100NEX. Additionally, with Auto EQ, you will be able to find the best sound settings for your particular car and driving conditions. Auto EQ setup has been nicely outlined in the user manual. Most formats of CDs and DVDs can be played on the AVH-4100NEX. To access the drive you have to click the Eject button on the button bar and click on the Disk icon on the screen. 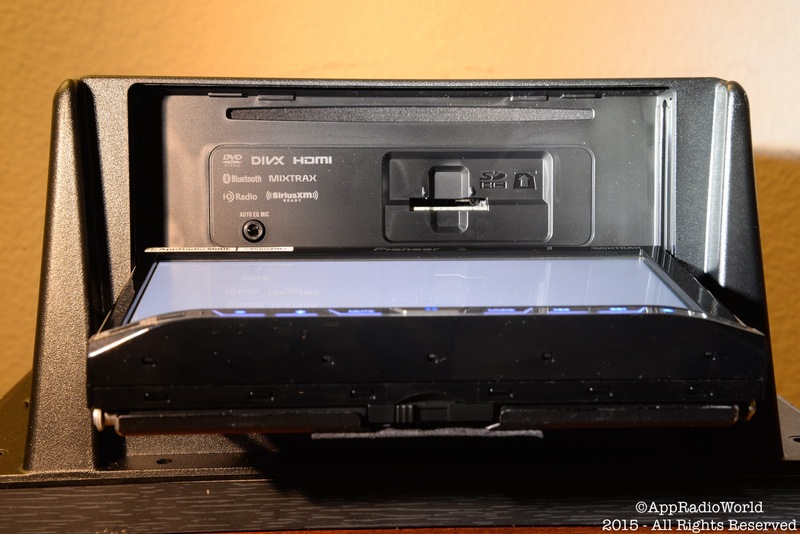 The motorized front panel then moves down and out to reveal the CD/DVD drive. 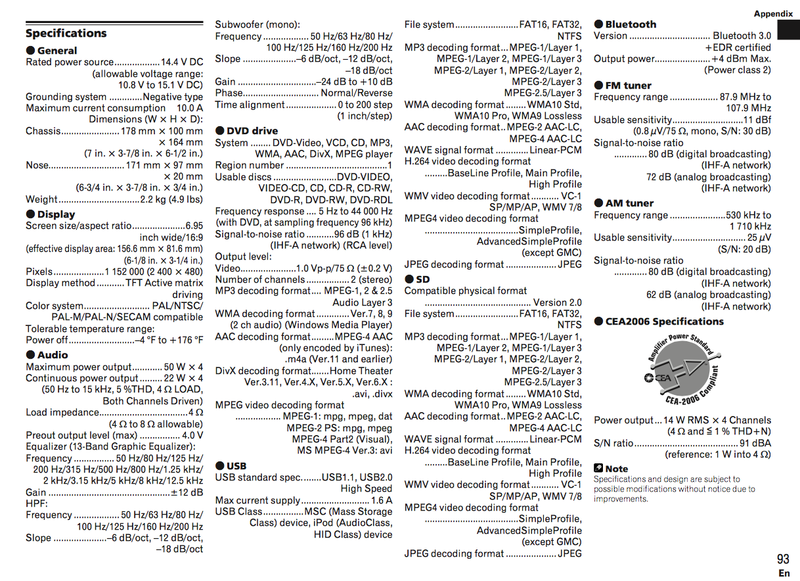 Full details on the compatible disk formats can be found on the user manual. AVI, MKV, MOV, F4V, MP4, 3GP, WMV, ASF, FLV, and VOB. You can use either USB 1 or USB 2 to playback video files. Video will not play when the vehicle is in motion though. There are a couple of very nice security features on the AVH-4100NEX. Firstly, you can setup a password for your head unit by heading into the Settings Menu and clicking on Anti-theft Settings. The password can be entered using the on-screen keyboard. 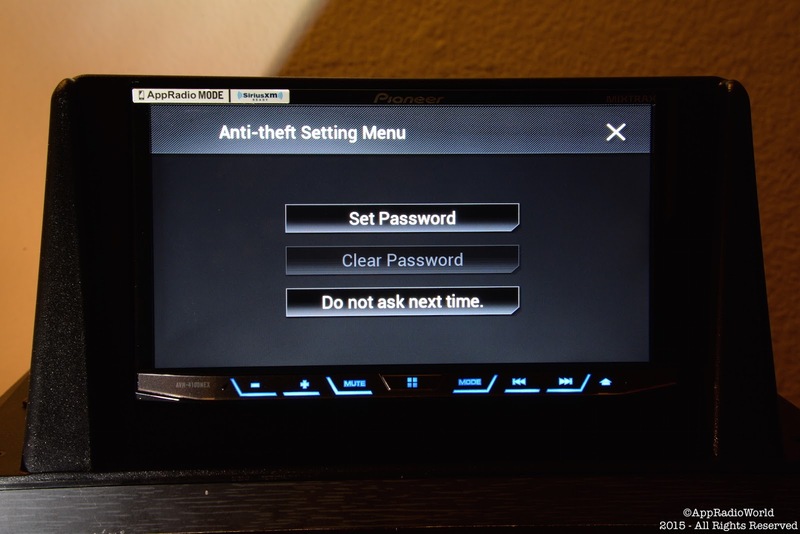 Setting up a password ensures that even if your head unit gets stolen, it won't be usable unless the correct password is entered. The AVH-4100NEX user manual also mentions that, in case you forget your password, you will need to contact an authorized Pioneer Service Station to have it reset. So keep that in mind when picking a password. Secondly, the faceplate of the head unit is completely detachable. 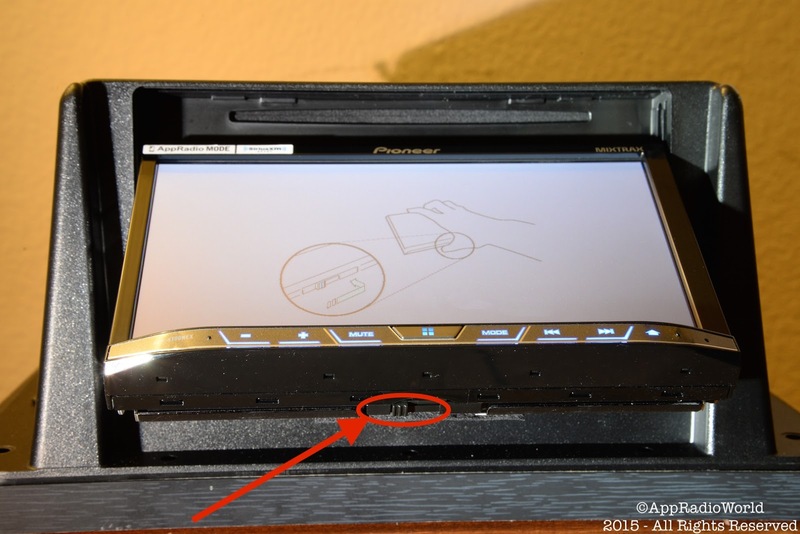 Pioneer includes a carrying pouch for the faceplate with the head unit. 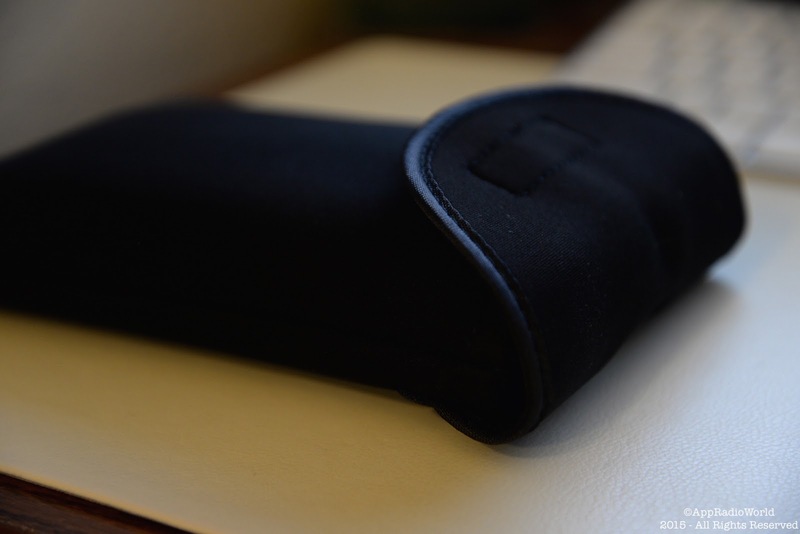 The pouch is made of a soft material and is padded. 1. Click the Eject button on the button bar. 2. Tap on the faceplate detach icon on the screen. The bottom end of the faceplate moves forwards and outwards to reveal a small dial located in the center of the lower edge. 3. Slide the dial to the right and lift the faceplate upwards and outwards to detach. You have to do this in one motion while having the dial pressed. If the faceplate is not lifted out from its attachment the device restarts. 4. To reattach, simply slide the faceplate into the top of the unit and push it into place. 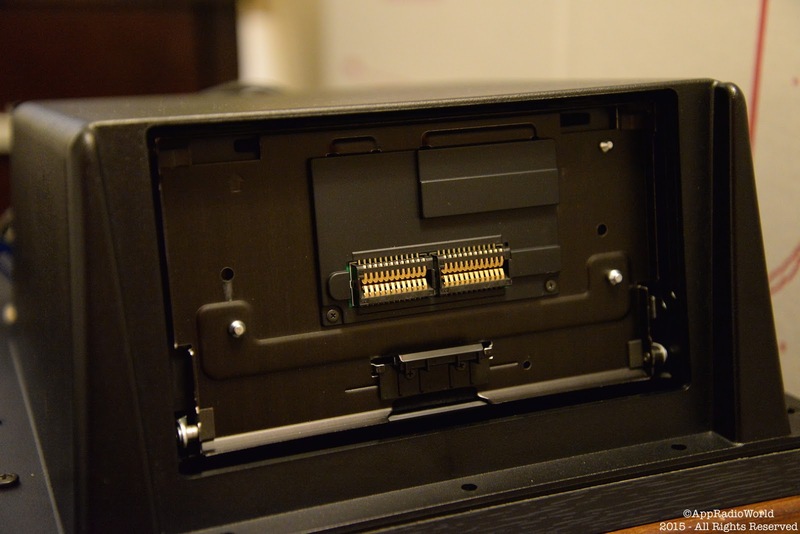 The inserter tabs on the faceplate should slide into the insertion slots on top of the head unit. 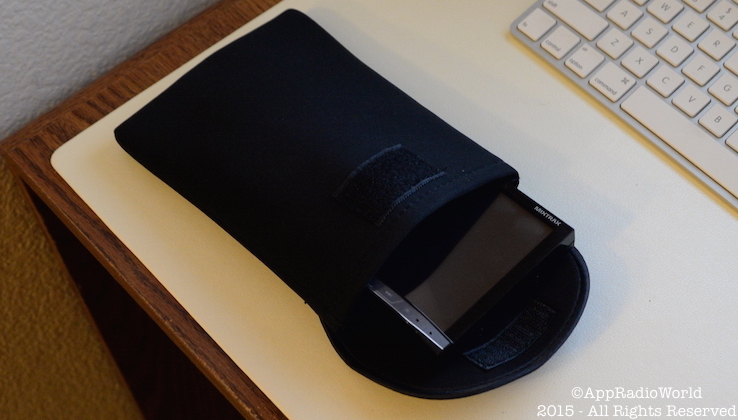 If you choose to remove the faceplate everyday, use the included pouch to store it. Do not leave the faceplate in the car, especially in plain sight. No review is complete without mentioning some cons. Some may view these as nitpicking but I have to mention them. 1. No AppRadio One? Pioneer recently made a splash by announcing AppRadio One which is an improved version of AppRadio Mode. AppRadio One uses a single USB cable instead of the bulky HDMI + Digital AV Adapter connection. But the AVH-4100NEX is NOT AppRadio One compatible. I was really disappointed by this. 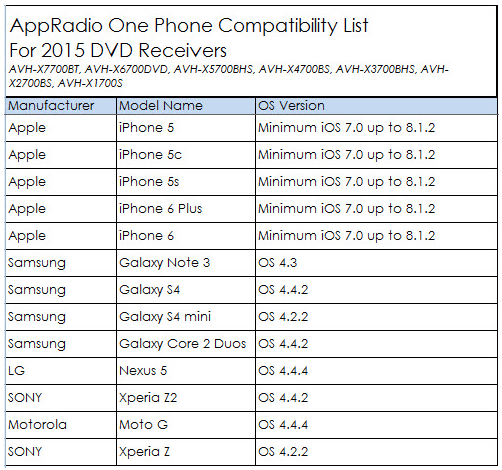 Only Pioneer's 2015 line of DVD receivers are AppRadio One compatible. There are seven head units in total. 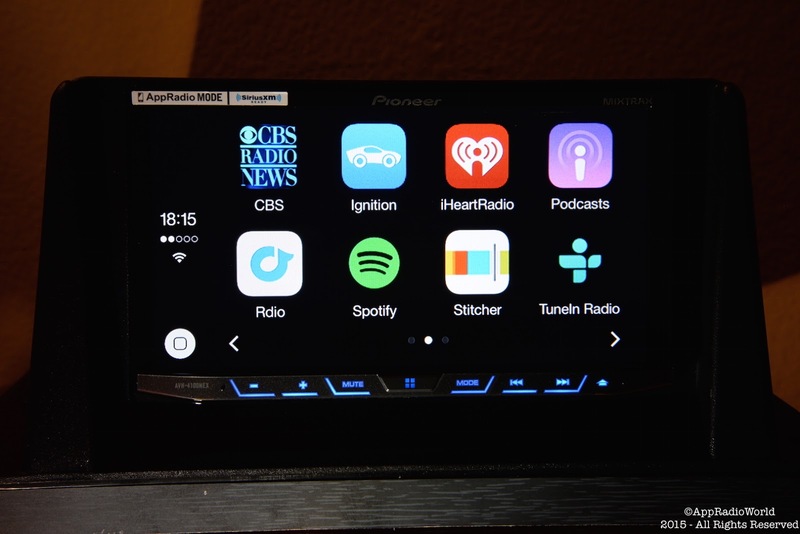 Maybe Pioneer is holding back AppRadio One for the AppRadio 5 or third-generation NEX receivers (which will probably feature Apple CarPlay + Android Auto + AppRadio One). 2. No Wireless CarPlay capability: Wireless CarPlay was supposed to be included in iOS 8.3 but Apple pulled it at the last second. Many think it's because the hardware technology wasn't quite ready to support it yet. But, Apple has promised to bring wireless CarPlay in iOS 9, as announced at WWDC 2015 earlier this month. Apple also mentioned that it will work only with compatible 2016 model vehicles. No mention on the aftermarket front was made. For CarPlay to work wirelessly you would ideally want wireless charging to be available too. CarPlay will definitely be a battery hog and without having the phone receive any power, it won't last very long on those road trips. Again, maybe wireless CarPlay capability is being reserved for the AppRadio 5 or third-generation NEX head units. 3. 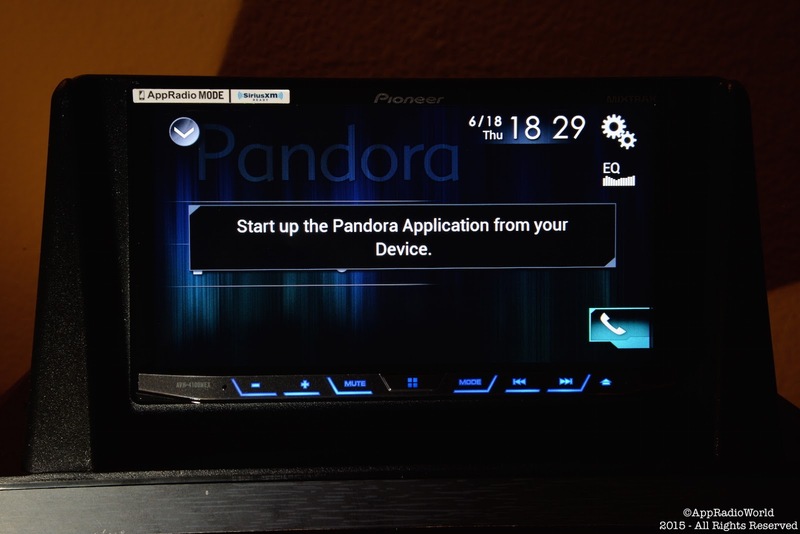 Pandora won't launch automatically: When you click on Pandora in the AV sources on your AVH-4100NEX, you will be prompted to launch the application on the smartphone. This can be unsafe and illegal to do while driving. It would be nice if Pandora launched automatically. 4. Switching between Modes: You can't switch between Apple CarPlay and Android Auto on the fly. You have to go through Smartphone Setup each time you want to switch. This means the device restarts when you switch. The good thing though, is Bluetooth connectivity happens automatically when you change your smartphone setup on the head unit. The device recognizes which smartphone to connect to via Bluetooth. The other good thing is, you can continue to charge your other smartphone/iPod via the USB port that's not being used. For example, if you're using an Android phone and Android Auto connected to USB 2, you can charge your iPhone/iPod connected to USB 1. If you want to use CarPlay, however, you will need to go through Smartphone Setup. 5. Extra USB Extension cable: Pioneer includes one USB extension cable with the purchase of the AVH-4100NEX. But you should buy an additional cable. If you're an iOS user and want to switch to Android at some point, it will be convenient to have a USB extension already attached to USB 2. This will eliminate the need to pull out your head unit from the dashboard. Also, either USB port can be used to plug in a USB drive to playback media files. Firmware updates have to be done on USB 1 only though. For these reasons, having a USB extension cable plugged in to each port and placed in a convenient location would be quite helpful. 6. Glare: Even though resistive touchscreens are better than capacitive touchscreens when it comes to glare, this can still be an issue on a bright and sunny day. I've had issues reading what's on the screen sometimes due to the glare. This is especially annoying when getting directions. A few months ago, I posted about a DIY project where I made my own anti-glare screen protector for the AppRadio 4. A similar method can be used for the AVH-4100NEX using different measurements. That post of mine has been quite popular and I've received a lot of positive feedback on it. Check it out for more details. 7. Warnings: I think it's about time Pioneer did away with warning messages. 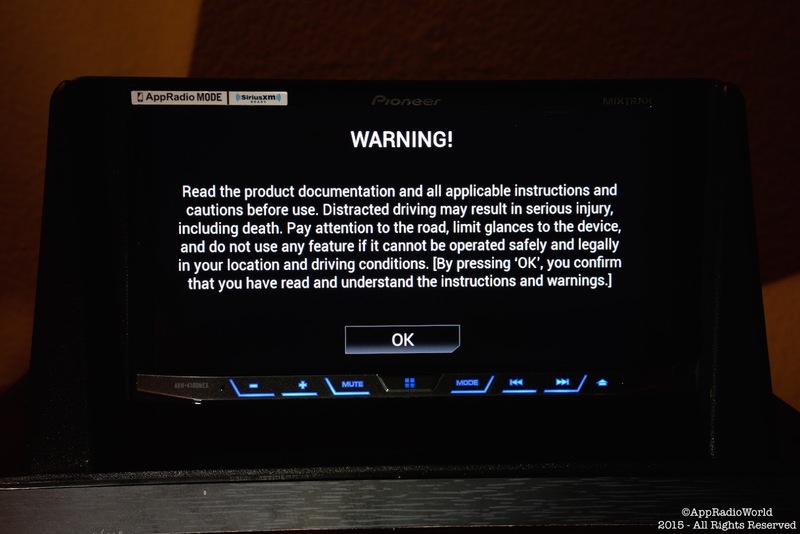 Why can't we have it the first time we turn on the device after installation, accept the risks of using it while driving, understand the liability of use, distracted driving, safety etc. etc., click OK and be done with it? Do we really need to be reminded and click through the warning message every time the device is switched on? The Pioneer AVH-4100NEX has a suggested retail price of $700. But, as I've mentioned in the past, you can always find lower prices at online retailers like Amazon and eBay. Those sites have many trusted sellers and resellers, most of whom offer warranty options. Note: When you purchase anything on eBay or Amazon using one of the above links, it keeps AppRadioWorld going. All the help generated from readers like you, help me to keep adding to this website. Shopping on eBay or Amazon via this website's links does not cost you anything extra. Thanks! I absolutely love the AVH-4100NEX. Pioneer has managed to make an already excellent product in NEX, even better in its second generation version. The interface is much quicker and smoother compared to my AppRadio 4. 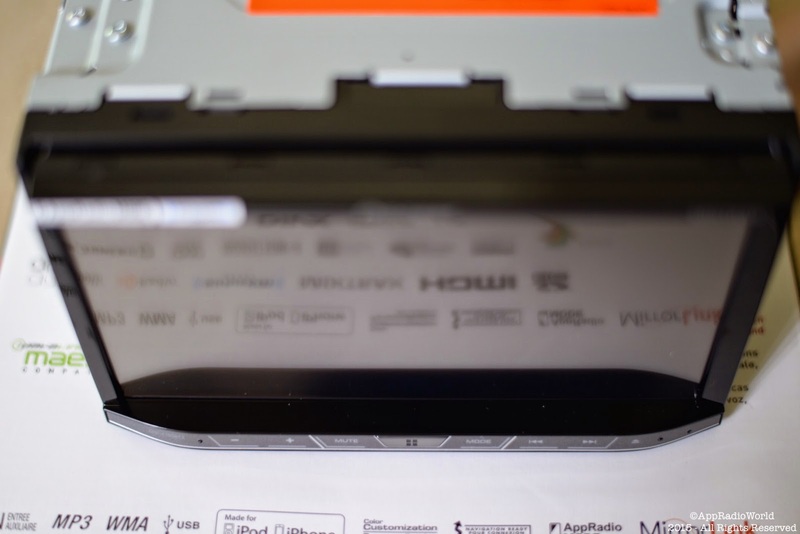 The larger 7-inch touchscreen is a definite upgrade when compared to the 6.2-inch screen of the AppRadio 4. And even though it's a resistive touchscreen, it works almost like a capacitive touchscreen. You have to try it to believe it. The anti-theft features are a good addition and should make the device more desirable than others in the category. If you plan on switching platforms (from iOS to Android or vice versa) anytime in the near future, buying a Pioneer AVH-4100NEX should be a no-brainer. Using your cell phone while driving is illegal in most places, so having a head unit that is capable of running both of the latest (and safest) in-car smartphone-integrated technologies should take away that risk. Maybe you live in a family that has users of both platforms. 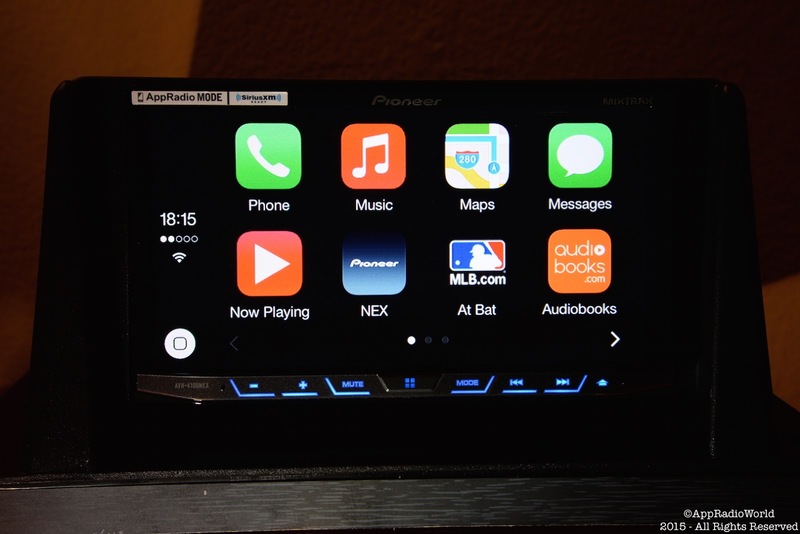 Having Android Auto and Apple CarPlay connectivity in the same device should make the AVH-4100NEX a must-have in that case. Why the AVH-4100NEX over the rest? First of all, the price point. The AVH-4100NEX is the lowest price double-DIN head unit to offer both Apple CarPlay and Android Auto. The only other two options right now are the AVIC-7100NEX or AVIC-8100NEX but those cost much more. Unless you need standalone GPS navigation independent of smartphone connectivity in addition to CarPlay or Android Auto. In closing, I should mention about other head units that are on the horizon and are expected to offer both Android Auto and Apple CarPlay. JVC Kenwood has been long overdue in delivering two head units: DDX9902S and DDX9702S. There's no sign of those devices yet. Parrot is the other aftermarket manufacturer that showcased its RNB6 head unit at CES 2015. There is no word from them on a possible release date or pricing yet. If you're in the market for a head unit upgrade for the vehicle you already own, and need something that will ensure you have the latest technology available at the moment, the AVH-4100NEX maybe the way to go. And you won't break the bank getting it. The best part is, even if competitor products become available in the next few months, they are unlikely to match the low prices on the AVH-4100NEX. I will continue reviewing this head unit in the coming months and report back if I find anything new. Thanks for reading this review. Thank for the review. It convinced me to trade-in a recently purchased AVH-x3700bhs for the 4100NEX. I'l primarliy be using Carplay but wanted to know which USB input I should use for AppRadio. I'll insert an HDMI cable on the back and I have the lightning to HDMI converster for my iPhone 6+. Can app radio be used with the HDMI and USB 1 plugged into the adapter? Also, how is the radio reception on this unit? I'm looking forward to having HD radio again. CarPlay requires only the USB cable, no HDMI needed. Radio reception is great. I have the prior year model 4000NEX and the Pioneer Pandora application is hit and miss. VERY frustrating!! Other than that, it is a well thought out unit though very slow and sluggish. They need to put more time in the programming of Pandora and speed up the unit. I understand that the hardware on the 4000 and 4100 are the same. Thank you for this review! I have been researching this unit and the Kenwood 9902S for a while. At first I was convinced that the Kenwood was better, but now I'm leaning more toward the Pioneer. I think the AVH-4100NEX will be my weekend purchase. I do have one question I'm hoping you can answer: Does CarPlay have to be run out of USB1 or can you run it from USB2 and have USB1 open for flash drives and other devices using the USB extension? CarPlay works only on USB 1. You can connect a USB Flash Drive to USB 2 but the head unit allows using only one device at a time. All rental cars from dodge, Chrysler and chevy all require that same stupid pop up dialog box accepting OK every time car is started too. Blame thowe who always sue because they didn't know cruise control wouldn't also steer the car and other frivolous lawsuits related to driving. Great review, thanks! I am trying to decide on this 4100nex or spend extra to get newer 4200nex. I see android galaxy S5 phone and know for the 4200nex pioneer dropped mirror link but added appradio one. How about a comparison review of the 4100nex vs 4200nex to see if processor speed is faster and some quirks from 4100nex addressed. And does the 4200nex have detachable face as well? Looking forward to more great reviews.